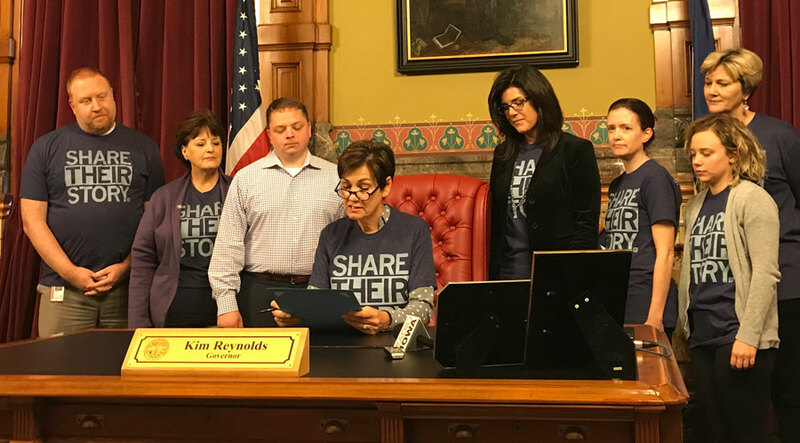 Governor Reynolds signs the proclamation declaring October as Domestic Violence Awareness month. The governor has declared October as Domestic Violence Awareness month. 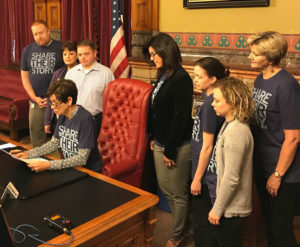 Kevin Hall of the Iowa Secretary of State’s office says 500 victims of domestic abuse, stalking and human trafficking are utilizing the state-run address confidentiality program. An estimated 29,000 Iowans will seek help this year to escape a violent domestic or dating relationship. 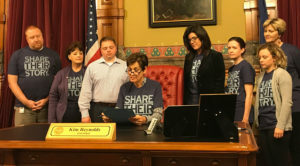 A coalition of groups including the Secretary of State’s office and the Iowa Coalition Against Domestic Violence have partnered on the www.sharetheirstory.net website. It invites survivors and their families and friends to explain how domestic violence has directly impacted individual Iowans. The website also features links to groups offering services to those seeking help.